Tom Morgan painted the image ca 1930's. Tag on reverse says "loaned by Herb Macaulay". 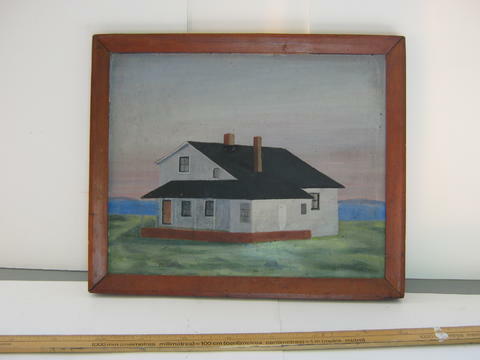 This item is a painting of the lighthouse keepers house on Seal Island, NB. The painting shows a storey and a half white house with a black roof. There is a veranda on the front of the house. The house has 2 chimneys. The house sits on green grass with a blue ocean in the background and land on the distant horizon. Hand written on the back of the painting is "Olsen, Grand Manan, NB, Seal Island house" and "1957 H.C.M." There is a white typed label on the back as well reading: 70. Morgan, Tom, Lighthouse Keeper's House, oil on fiberboard, 12 x 15, 1930's, loaned by Mr. Herb Macaulay". This numbered tag is similar to other tags we have seen from art shows held on the island or from the early years of the Grand Manan Museum. The "1957 H.C.M." could be Herb Macaulay loaning it in 1957 before the tag was attached but this date pre-dates the museum by 8 years.